Take a good, careful look at the chart below. 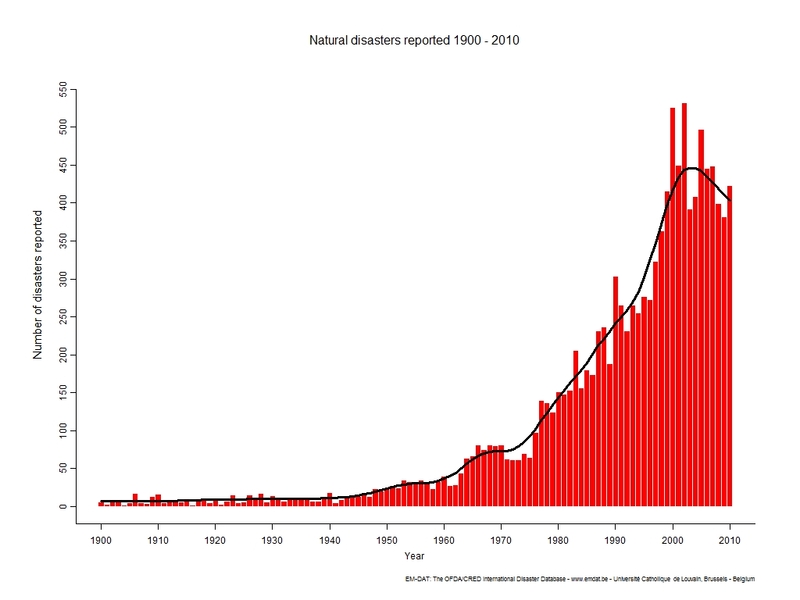 The chart, courtesy of Emdat (www.emdat.be/natural-disasters-trends) reflects the number of reported disasters from the period of 1900 to 2010. Unfortunately, Emdat does not yet have the data up for 2011, a year full of very expensive disasters, so we have to work with what we’ve got. But what we’ve got is extremely interesting and also, alas, full of gaps. When looking at this chart, it is very important to keep in mind that what is represented is reported disasters. So, in areas sparsely populated back in 1900 or in countries that did not track disasters, or in areas where there was no media to report the disasters, then of course disasters were not reported. Given the gaps in data, we have to be very careful that we not make broad, sweeping statements about the increase of disasters from 1900 to, say, 1970. That argument, however, weakens as we enter the age of satellites and omni-present media. Such changes can probably be argued to account for much of the increase even into 1980’s. But the argument falls apart as we enter the 1990’s and the new millenium. Can improved reporting really account for the doubling of reported disasters between the 1990’s and the first decade of the new millenium? It is an argument without credibility. It really is a pity that we do not have 2011 data on the chart. I don’t know if the sheer number of disasters would in fact be greater, but it is clear that records were set in 2011 in terms of damage done by disasters. Still, taken by any measure, it is clear enough that we are in an age of increasing disasters – increasing in both frequency and in damage. When Christ described what would happen prior to His second coming – when he articulated the signs and symptoms that would accompany the end of our age – he placed a certain emphasis on natural disasters. Included in these were “famines, pestilences, and earthquakes in various places” (Matthew 24:7). The same discourse by Jesus is recounted in Mark 13, but in verse 8 Mark adds “troubles” to the list (NKJV). I think we can fairly include disasters of all kinds as “troubles” given the context. That we are experiencing an increase in disasters is pretty much inarguable (including, yes, an increase in earthquakes even if the increase is tied to “fracking”). Students of prophecy and observers of the world will know that we are living in the final days of earth’s history. The implications are huge. For a description by Christ Himself on what is coming next, get a Bible and read the 24th chapter of Matthew. What is driving the increase in disasters now instead of say, a thousand years from now? What confluence of forces is almost unmistakably pointing to the end of the age and the soon coming of Christ? That is a subject for another post, and I will try to get it written soon.